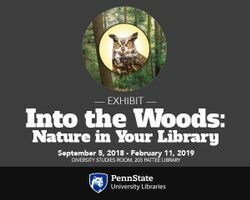 Exhibit: "Into the Woods: Nature at Your Library"
Penn State University Libraries presents a new exhibit that explores the eastern U.S. forest, its wildlife, and botanical wealth, and gives special tribute to early women naturalists and conservationists. Featuring nature-related materials from the University Libraries’ life sciences, maps and archival collections, the exhibit opens on Sept. 5 in the Diversity Studies Room, 203 Pattee Library, on the University Park campus. The exhibit is free and open to the public during Pattee Library’s Middlemas Arts and Humanities Library operating hours. “Into the Woods: Nature in Your Library” explores the invaluable work of women, such as Mira Lloyd Dock, Rachel Carson, Florence Augusta Merriam Bailey and Rosalie Edge, among others, who championed tirelessly for the protection and preservation of the area’s natural resources. Visitors to the exhibit can learn about the history of Penn State’s forest science program, which began in 1903 when the governor of Pennsylvania established the Pennsylvania State Forest Academy in Mont Alto –– then one of only three forestry schools in the country. Other highlights from the exhibit include select materials from the Libraries’ Kneebone Mushroom Reference Collection, which focuses on mushroom cultivation and mycology, and the George Harvey Fly-Fishing Literature Collection, which covers topics of importance to fly fishing and angling. The exhibit also displays a page from the Libraries’ 14-volume Romeyn B. Hough’s American Woods, a compendium of 237 American wood samples. Exhibit visitors also can learn about the best Pennsylvania hiking trails and trout streams, as well as “spot” images of Pennsylvania wildlife, including raptors, foxes and mountain lions. The exhibit offers a nature-themed quiz and 3D printed materials fabricated in the University Libraries’ Makers Commons, a 3D printing partnership between the Libraries and Penn State Information Technology’s Teaching and Learning with Technology for a University-wide initiative to enrich the Penn State teaching and learning experience through 3D printing. Conservation — the care, protection and management of natural resources — began in earnest in Pennsylvania during the early 20th century as a result of the environmental damage incurred by burgeoning industry and urban growth. During this time, large swaths of native forest were clear-cut by timber barons anxious to supply the charcoal necessary for ironmaking. Such devastation resulted in erosion, flooding and wild fires, greatly impairing the forest’s ability to regenerate. "Much of the beautiful forest and wildlife surrounding this campus has survived thanks to the brave efforts of past conservationists,” said Pembroke Childs, information resources and services support specialist at Penn State University Libraries and the exhibit’s curator. “From their stories, we can be inspired. Perpetuating their visions, we discover our intricate and balanced woodland home." “Into the Woods” pays homage to those scholars, artists, scientists, teachers and activists, whose concerns about conservation long predated today’s environmental movement. Focused on collecting, watching, learning and advocating, the individuals showcased in the exhibit were committed to ensuring that the natural world would be protected for future generations. The exhibit also was partly inspired by the reopening of the University’s Shaver’s Creek Environmental Center during the Labor Day holiday weekend, following an extensive expansion and renovation project. “Into the Woods: Nature in Your Library” is scheduled for display through Monday, Feb. 11, 2019. For more information about the exhibition, contact Pembroke Childs at prc107@psu.edu or 814-863-2332.